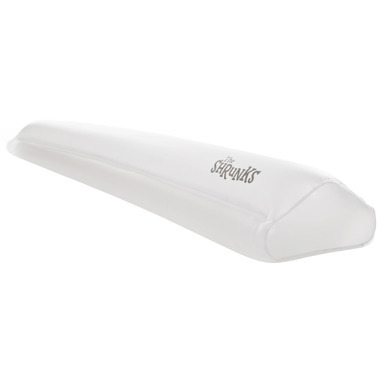 Keep your child safe from rolling off the bed with The Shrunks Inflatable Bed Rail. 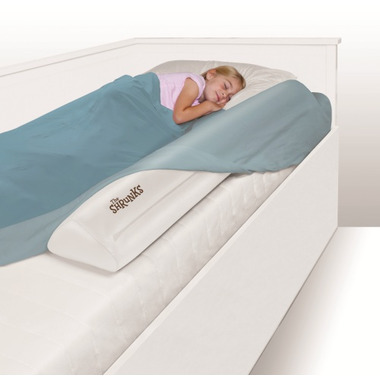 Its slim design allows the bed rail to slip conveniently under any fitted standard sized twin, queen or king size bed sheet. Includes compact foot pump and convenient carrying bag. Inflated size: 48 x 7 x 6.3"
I'm so glad we went with this bed bumper over some of the more complicated guardrails out there. It is lightweight and portable (and comes in a cute bag with a foot pump), but the material is very strong and there are traction pads to keep the bumper in place. It really does stay where you put it. I've already recommended it to family members and friends.